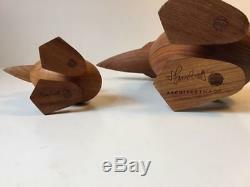 UP FOR SALE IS A BEAUTIFUL WOODEN (TEAK) DUCK & DUCKLING BY THE FAMOUS DANISH DESIGNER HANS BOLLING AN EXQUISITE PIECE OF DANISH / NORDIC / SCANDIVIAN HISTORY. 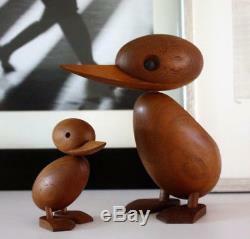 THIS LITTLE DUCK'S & DUCKLING'S DESIGN IS FROM 1959, AND ARE REALLY, REALLY SCARCE. 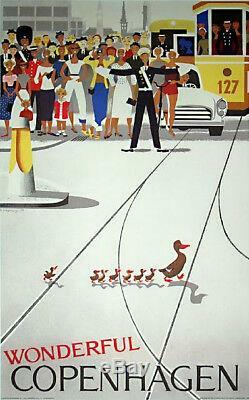 HANS BOLLING WAS INSPIRED BY THE FOLLOWING: IN THE 1959 A POLICE MAN IN COPENHAGEN WAS PHOTOGRAPHED WHILE HE WAS HOLDING BACK TRAFFIC SO A DUCK AND HER DUCKLING SAFELY COULD CROSS THE ROAD. THE PICTURE WENT FAMOUS IN MOST OF THE COUNTRIES IN THE WORLD AND MADE THE IDEA OF DENMARK TO BE A FAIRY TALE COUNTRY. (PLEASE ALSO SEE A PICTURE OF A TOURIST POSTER FROM THE EARLY 1960'ES, AND A PICTURE OF THE DESIGNER HANS BOLLING) MEASUREMENTS: DUCK HEIGHT: 18 CM (7). DUCKLING: 9,5 CM (4) THE PAIR IS WITHOUT FLAWS AND ARE IN ABSOLUTE STUNNING CONDITION. The item "HANS BOLLING DUCK & DUCKLING MID CENTURY MODERN ERA DANISH MODERN STUNNING" is in sale since Saturday, September 15, 2018. This item is in the category "Collectibles\Vintage, Retro, Mid-Century\1960s". The seller is "mlabich24" and is located in Copenhagen. This item can be shipped worldwide.